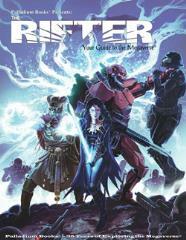 #75 "How to be a Game Master, Splicers, A Town in Canada"
Rifts Primer – G.M. and Player Tips, and a Rifts Adventure, by Carl Gleba and Kevin Siembieda – “official” source material. The Rifts Primer is jam-packed with G.M. advice, player tips, personal experiences, and examples of game play, explanation of rules, a step by step outline for creating your own adventures, and two adventures to get you started. The sample adventure is written in such a way that new players who have never played Rifts, or are completely unfamiliar with the Palladium game system, can run it with just the information presented in this article! New Game Masters and experienced G.M.s alike will enjoy the discussion about the art of role-playing and being a Game Master. Splicers – I am Legion, Part Four, by Charles Walton II, Chris Kluge and Lance Colley – “official” source material. The adventure continues as Legion reveals part of her sinister plans to your heroes which brings this adventure to a fever pitch. Your heroes must make difficult decisions and must find a way to stop her and her array of deadly machines. Plenty of psychological and horrific terrors to face. Includes a horrifying new machine and more. Do not miss this new chapter as heroes fight against Legion and her army of deadly machines. Rifts for Savage Worlds Preview. Get a look at the cool Rifts RPG that uses Savage Worlds rules. The game was a smash Kickstarter hit, and will be arriving on store shelves in the beginning of 2017. Rifts cover by Garrie Gastonny and Chris Bivins (Rifts: Savage Worlds). 96 pages – Cat. No. 175.